A photo montage of generals; Henry Tumukunde (left) and Kale Kayihura. File photo. 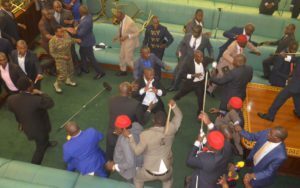 KAMPALA – President Yoweri Museveni authorised the deployment of the commando section of the Special Forces Group (SFC) at Parliament, a move that resulted into a massive brawl in the House as the youthful soldiers tried to evict MPS that had been announced suspended by Speaker Rebecca Kadaga. The President announced during a Tuesday night National Security Council impromptu meeting that took place at State House, Nakasero that it had been decided that the SEC specialised section would provide backup to the Speaker to reign order in the House, after MPs opposed to the proposed Bill that seeks to Ammend Article 102 (b) that would lift the age limits for a presidential candidate used every trick in the book to stop it. The move is seen as being engineered to favour President Museveni who is ineligible to run for the office he currently occupies at the next elections because of the age cap. Highly placed securiry sources told PML Daily that Museveni’s communication left his security chiefs divided, with Security Minister Gen. Henry Tumukunde cautioning against deploying soldiers at Parliament. Kale Kayihura, the Inspector General of Police has taken early credit for the unpopular decision to attack parliament with soldiers but it is understood the IGP sees this as an opportunity to get one over Gen. Tumukunde with whom they don’t see eye to eye. During the meeting on Tuesday, Gen. Tumukunde warned that the move would attract far-reaching historical consequences for the army, reasoning that the Speaker did not need the backup of soldiers to bring order to the House. SFC officiers picking microphone stands thrown at them by MPs. PML Daily photo. Speaker Rebecca Kadaga and all security chiefs including Gen. David Muhoozi (Chief Of Defence Forces), Kale Kayihura (the Inspector General of Police) Col. Don Nabaasa (Commander SFC) and leaders of ISO and ESO, attended the meeting. Sources say Gen. Tumukunde stormed out of the meeting after his strong views against deployment of the army commandos at Parliament were rejected by a “bullishly moody” Museveni. “Tumukunde immediately left the meeting and the President told his chiefs that even if all of them stormed out, he had decided to deploy his boys,” the source told PML Daily. “You can all leave but the boys will be there,” the president was quoted as saying. MPs fighting with SFC officers in the chambers of Parliament. PML Daily photo. 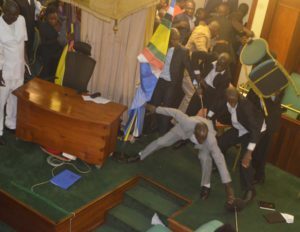 Confirming Gen. Tumukunde fears, the brawl caused by the soldiers as they forcefully evicted MPs on Wednesday has been widely condemned by both local and international community as well as in diplomatic circles. The 1995 Constitution that Museveni supporters seek to ammed has now been tagged “The Gun Point Constitution”. Police chief Gen Kale Kayihura claimed responsibility for the raid by security personnel on Parliament. He said the police were deployed after information leaked that some elements within the Opposition wanted to burn down Parliament. Kayihura confessed he had invited personell from sister security agencies to beef up police. “Our officers were disciplined by not overreacting towards the MPs who had resisted being taken out of the Parliament. While the law allows them to defend themselves upon being attacked, the “officers at Parliament accepted humiliation,” Kayihura said. House Speaker Rebecca Kadaga has won both praises and ridicule over Wednesday’s incident. File photo. Observers say the police was completely out of operation but Kayihura sees the brawl as an opportunity to get one over Gen. Tumukunde who was openly lukewarm to the idea of deploying soldiers at Parliament. Party leaders like Norbert Mao are asking Kadaga to immediately resign, arguing that in the history of Uganda, the army has never invaded Parlaiment. Dr. Kizza Besigye has also in a statement, cautioned Kadaga to stop being used by Museveni, in establishing his life presidency against the will of Ugandans. Appearing on NBS this week, Ibrahim Semujju Nganda, the Kira Municipality MP accused Kadaga of having attended a meeting, where it was agreed that the MPs should be evicted. MP Theodore Ssekikubo has anmounced he is gathering evidence to sue individuals, running SFC, for having been involved in raiding Parliament. He said he has a list of about 20 soldiers, whom he is dragging to courts of law, next week. As the opposition MPs were attacking Kadaga for failure to protect them when the security agents forcefully evicted them, some NRM legislators were seen praising her. 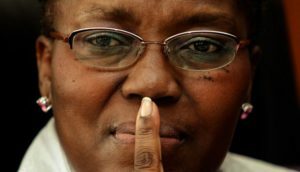 MPs Peter Ogwang, Nsaba Butoro and David Bahati are among the legislator who think that Kadaga put the August in order. In an exclusive interview with New Vision today, the Government newspaper, Kadaga defended her move to suspend the 25 legislators, saying that they were misbehaving. She argues that there was an attempt to capture Parliament, since last week, adding that she had to stop it.